Pros: Crowning Glory is dynamic, versatile, and unapologetic in its exploration of beauty and identity. Cons: The show concentrates on very specific experiences and may at times feel alienating to some audience members. Our Verdict: Crowning Glory is a worthy and polished navigation through topics of beauty and identity, combining humour, passion, and style with expertise. Somalia Seaton’s Crowning Glory is a play about owning yourself. Through a series of monologues about the female experience with modern ideals of beauty, the play comments on the experiences and challenges of owning your body and your sense of self in a culture which sets double (and impossible) standards for women’s bodies and relationships to those bodies. Each piece stands alone in its own right and together they form an hour-and-a-half long play. 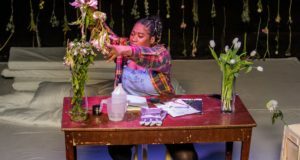 The show delivers a succinct and powerful message about claiming oneself, threaded together by the struggle with a woman’s “crowning glory” (her hair). The script makes a bold and tangible statement about the absurdity of something so external being such an undeniable determining factor for our lives and relationship to ourselves and others. Nine monologues, several short choruses and interspersed multimedia presentations create a diverse and stimulating experience on stage. The play is both delightfully funny and achingly heartfelt, acknowledging those merely inconvenient things about being a marginalized woman, such as never being able to find the hair product one needs, along with pointing out behavior and association that is unfair and hurtful, such as harassment, ignorance, and fetishism. The play is obviously well-written and well-performed, and in addition is well designed and perfectly suited to the Stratford East. A simple set of ramps and scrims added visual versatility and helped the play’s monologue style to remain dynamic, giving actresses plenty of room to move, change levels, and interact with the space and the audience. Pre-filmed interviews and clips were presented between scenes, presenting real women’s thoughts and experiences on their relationships with their bodies, providing a different insight to compliment the work on stage. While I found the play to be incredibly moving and overall well-balanced, the only concern I might have for potential audience members is that it might seem at times to be exclusively aimed at females or specific cultures. I for one, think that the fresh and unique perspective of the piece is a blessing. 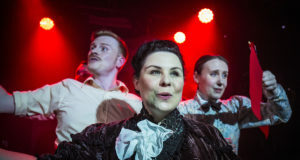 Anyone seeking mere entertainment might be better off sticking with a commercial West-End musical, but anyone willing to mix some challenge in with their fun would find Crowning Glory to be an ideal choice for an evening out. Crowning Glory will run at the Theatre Royal Stratford East until 9 November.